Powerful PowerPC-based process station, Ethernet, 2x RS485, 2x RS232, web server, programming in SoftPLC IDE. The IPLC range is a family of digital process stations – communicative DDC controllers. 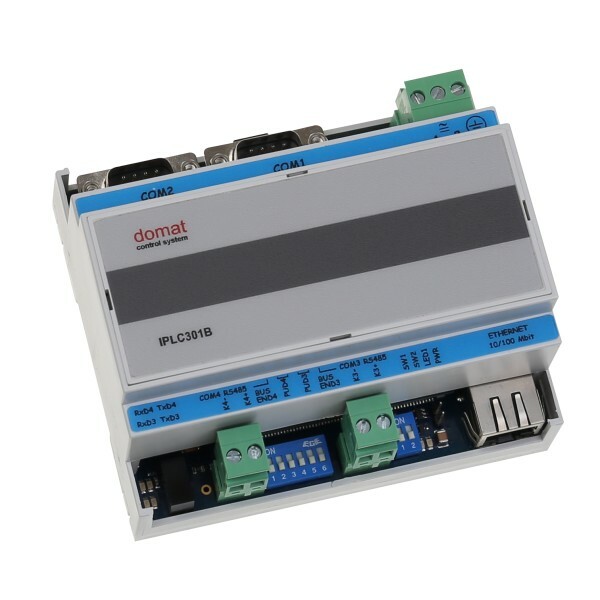 All types contain one RS485 interface for connecting of I/O modules and one Ethernet port for communication with a management station or a web browser for remote management, extended types provide two more RS232 ports and one more RS485 port. The controller contains an embedded operating system which boots up the runtime with the application. On the board there is a real time clock with battery backup, alarm buzzer, flash memory containing OS, runtime, application, and other data (time programs, setpoints etc. ), and a watchdog. The controller also includes one Ethernet port, 2x RS232, and 2x RS485 serial interfaces. The RS485 communication is indicated by two LEDs at the bus end switch, another LED is software-controlled from the application. The SW1 – if set to ON – disables runtime start after power up and thus opens safe service access to the OS in case of corrupted application. The application is downloaded either in the Integrated Development Environment (IDE) or over a FTP connection in the file system of the controller.